Today was another interesting outing with a few of the Manawatu lot - after some discussion on Facebook and consulting of the weather forecasts, today was picked for a day trip to Castlepoint. 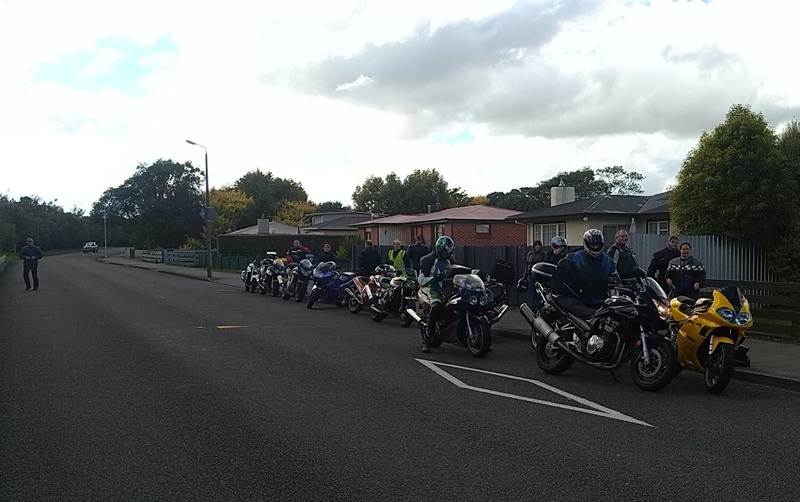 Our meeting point was in Pahiatua as we had riders coming from Danniverke and Waikane as well as Palmy and Ashhurst. I left home on damp roads and soon caught up with a big mob of bikes heading over a wet Pahiatua Track. The road was reasonably damp and these guys were taking it pretty easy. They ended up turning off and heading towards Mangamire while I continued on to Pahiatua to meet up with the rest of the troops. Fueled up I parked up next to a couple of dodgy Triumph riders (although one of these had the sense to bring his Kawasaki today) and waited for the rest of the guys to show up. All the while we were parked up the skies were grey and the clouds slightly leaky so we still were not quite sure what we were heading into as we started to head South. Turning at Eketahuna to cross over to Alfredton and Route 52 we still had the odd damp road but things were looking like they were changing for the better. The ride down 52 was absolutely fabulous - the roads in good condition and not too many damp corners to worry about. The autumnal colours, falling leaves and green fields (that recent rain in action) also made for a pretty scene. 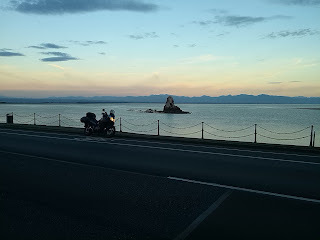 After a regroup at the Masterton-Castlepoint turn-off we were soon on the road to Castlepoint. Once again we had a really nice run through to Castlepoint and it was nice to see a few old nasty road works fixed up and long gone. At the beach we quickly grabbed a bite to eat from the shop and took it back across the road so we could enjoy our surroundings as we ate and shot the breeze. While chatting we made an interesting discovery - we were missing someone! Nick and the mighty GSX250 had not pulled up with us! Luckily thanks to modern technology (a phone) we were able to track him down - he had spotted a group of bikes (the same group I'd followed over the track) at a pub just out of Castlepoint and thought that that was where we were. So he got to make some new friends and probably got a better lunch than us and we were able hook back up with him on the way back out. 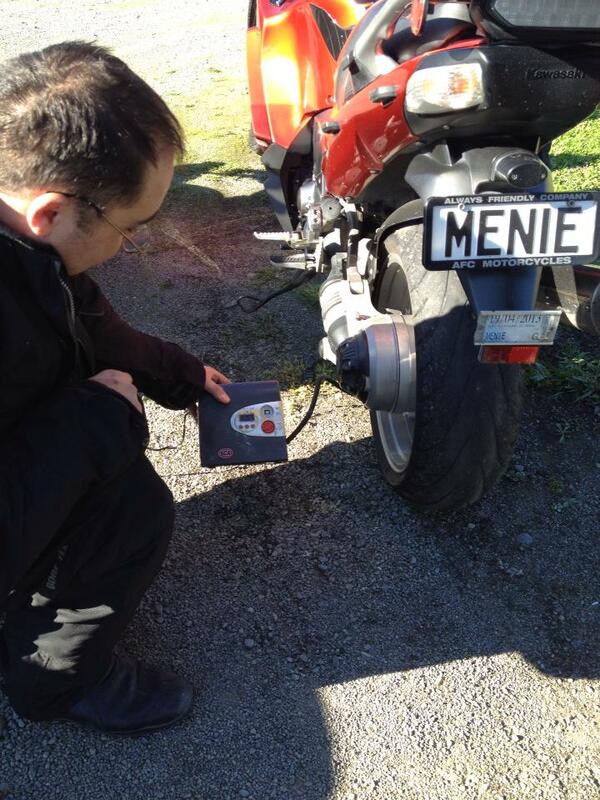 In Masterton we were surprised to see Nick turn up and no Meanie - oh, oh! Once again a phone made the discovery - the Red Connie had picked up a puncture and Meanie's first attempt at fixing had not held. Everyone quickly mounted up and raced off to offer assistance. Another plug in the tyre and some air from my little compressor and we were off again - for a while. Unfortunately the hole in the tyre was quite big the tyre plugs were just not doing the business. We ended up stopping a further 3 times with success finally coming when we managed to push 2 plugs through the hole and eventually get Meanie home safe and sound. Not the best end to the day's ride but everyone got home safely and had a ball! What a great way to enjoy a perfect Autumn day! With all the rain we have had lately I've been keen to get out on the DL as the rain obviously sorts out the dust and also kind of settles the gravel down a bit making gravel riding easier. Today I decided to check things out and after a morning of pottering around the house I saddled up and made my way out to Ashhurst. In Ashhurst I had a brief stop to buy something to take with me for lunch before heading out the Pohangina Valley. The gravel on Pohangina Valley West Road was just what I expected - in perfect condition for letting rip on the DL! When I hit Makoura Road I turned right on some more awesome gravel and made my way to Umutoi via Pohangina Valley East Road. At Umutoi I turned off onto more gravel on Umutoi North Road which then took me to Tunipo Road. This was only my second time on these roads (the first occasion was on a BRR ride) and it's really neat. Things start off quite tight but on Tunipo Road there a few nice fast sections before you drop down steeply to meet up with Pohangina Valley East Road again. This was where I chose to stop for my forgettable lunch (filled roll must have been made last month). 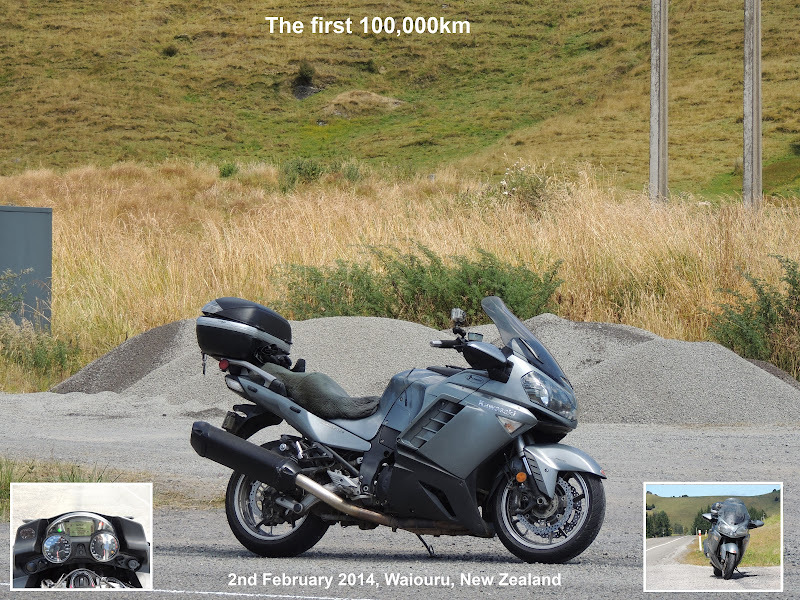 In Rangiwahia I had to make a quick U-turn as I spotted a scene worth capturing for a photo competition on the V-Strom Forum. This week's challenge was to get a pic of your bike with derelict machinery/buildings. I had been past a few old farm buildings but they were generally off the road a bit so hard to get a decent pic of them and the bike. This scene had it all - a run down old building and all sorts of old junk including the neat little 'dozer. After taking Peep O'Day Road and a few other gravel roads I eventually made my way back to Beaconsfield and then onto SH54 into Cheltenham. I had been pretty lucky with the weather with only the odd spit of rain and some blustery conditions on Peep O'Day Road but when I popped out onto SH54 I really hit the wind - and it would last all the way home. When it was at my side the poor old DL got blown around a bit and the peak on my helmet helped the wind give my neck a good old workout too. But I made it back safe and sound after a good little pootle of about 187km and happy to have been able to get out and revisit some great roads. After a very wet Dawn Parade and a nice brekkie Brian, Chris and I set off to dodge the rain and try to get a wee ride in. Brian and Chris had done the Apiti loop in clockwise direction a few weekends ago and needed to go back around the other way to unwind. Cruising out of town there was a pretty reasonable breeze blowing but there was also plenty of blue patches in the sky. Trundling around the loop we took things easy as there were plenty of greasy spots but overall the road was in pretty good condition considering we have had a bit of rain over the last few weeks. Nearing Apiti the weather stayed pretty good apart from some very light spits but we had to pause for a while as we were missing someone. Brian and I waited for a bit and then eventually we saw a dim headlight in the distance. Soon there was noise and this hove onto the scene. After dishing out some grief we pottered the last 2km into Apiti and I went looking for the war memorial for a photo. I didn't get the photo as there were a lot of people all getting ready for the Apiti remembrance service. We rode onto Kimbolton and while Brian waited for someone I went and checked out the Kimbolton Memorial. Kimbolton is a small rural area so it's pretty sad to see so many names on their memorial - but good to see that they are remembered. After taking a couple of pics I rode back to meet the guys at the cafe for lunch and while we were there a couple of other riders turned up and so did some light rain. Saddling up for the ride home we made for Cheltenham and by the time we got there it was raining properly and stayed like that for the rest of the wet trip home. But I had to post up these awesome vids of a crazy Canuk's extreme winter ride on his clapped out KLR. They're really well made and he sure has an awesome sense of humour! Compulsory viewing! A few weeks ago there was a bit of chit chat amongst a few of the local kiwibikers that we hadn't had a get together for a wee while and that the situation should be remedied. Slowly a plan was pieced together and yesterday was set as the date for the meet. With a fair bit of rain on Saturday and during the night it looked like a damper was going to put on the ride but by the time I dragged myself out of bed the sun was out and things were looking good! The plan was to meet up in Sanson for brunch and then we could fight over decide on a wee pootle afterwards. I rode over to Sanson by myself and by the time I rocked up just about everyone was there and after ooing and arring over the assorted bikes we made our way in sample the fare and talk crap put the world to right. It was good to catch up with a few I hadn't seen for a while and to meet a few new faces. After brunch we were led on a magical mystery tour by Barry which took in a lot of back roads in and around Fielding and Halcombe. Check out the route! On returning to Fielding it was time for some to make their way home while a few of us still had not had enough and decided to ride the Halcombe road through to SH1 and back before pausing in Fielding again for a drink and the final good-bye. Roadside discussion in Fielding - where next? My second pic is from my recent Top of the South Adventure and is of the V-Strom parked in front of the French Pass. This pic is special as it marked a return to "the Sounds" for me - about 25 years (far too long) after I had last been down. It is also a beautiful wee part of the world. An added bonus is a dusty looking bike - she'd been out there doin' it! Saturday was a bit of a sad day - it was my last day in the fabulous South and that meant I was getting closer and closer to having to go back to work and give up my ticky-touring around. As mentioned in an earlier post, part of the reason I had chosen the week before Easter as my week off was that the Omaka Classic Fighters Airshow was on over Easter and had my name written all over it. So, I got up a bit earlier on Saturday, had my brekkie and said goodbye to Julie, Dan and the girls and hit the road. The ride over to Blenheim wasn't the greatest as there was a lot of traffic on the road all heading for the airshow - it probably took 20 minutes or more to do the last couple of km into the parking area. Blenheim was putting on a fabulous day for the show so plenty of sunscreen was required and as I made my way into the airshow a couple of P40's were already kicking things off. Not only was there a lot of great aircraft parked and ready for their displays but there were also a lot of vintage military vehicles and displays and also some classic cars. The airshow itself was absolutely fantastic and I particularly enjoyed the WW1 aircraft display and then the display by two spitfires joined by a Focke Wulf 190 (it's first airshow here). The FW190 had a different (but lovely) sound to the Spits but all three made beautiful music together! The Red Baron rides again! Got myself a classic Spit piccy! As I mentioned it was a pearler of a day and I got very hot in my bike pants (drank gallons of water) and my feet got really sore in my Adv boots (not recommended for a lot of walking) so after the Spit/FW190 display I started making my way towards the car park for a slightly early departure. But then the magnificent Corsair came out to play. This beautiful aircraft is really put through it's paces (a lot of the other stuff is treated a bit more gently) and it is truly magic to see it dancing across the sky in front of you. What a great end to the show for me! Leaving Blenheim I pottered over to Picton where I had a coffee in one of the waterfront cafes before buying more water and popping up to the lookout to await my ferry. With Friday being a public holiday the girls were off school and Dan had put down his hammer so the DL got to have a rest and Dan's boat got wet. 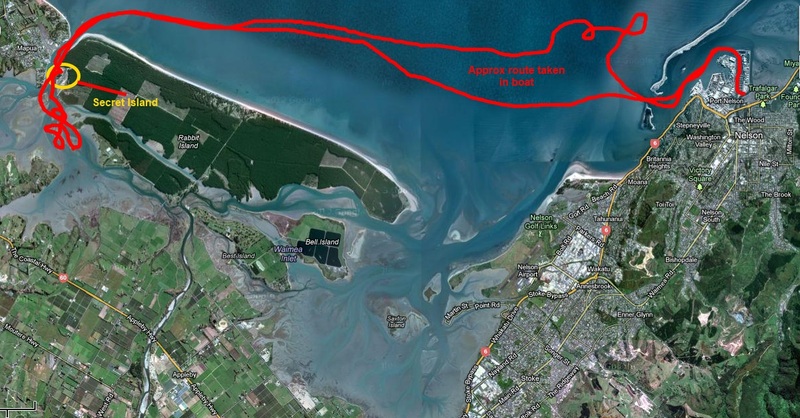 After launching at a very popular busy boat ramp we slowly made our way out the harbour. As we cruised along the foreshore before exiting the harbour through "the cut"
After a bit of stooging around it was time to get a bit more serious and try for a fish. We parked up with another group of boats and sat around for a while waggling some baits in the water but unfortunately to no avail. But we had a nice picnic lunch packed so it was time to find somewhere to enjoy it. And then we found The Spot. After unloading supplies and passengers the boat was anchored and the picnic was set-up. With full bellies we then spent a fair bit of time relaxing and exploring the island. There was even someones old dugout canoe that was worth investigating. As the tide was going out and water surrounding the island getting shallower we had to eventually get while the getting was good otherwise we'd be stuck on our deserted isle for a bit longer than we wanted. 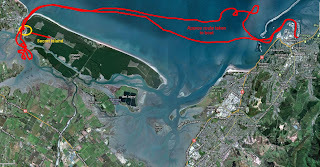 The boat was loaded and pushed out into deeper water and we made our way out into the estuary. After a few doughnuts in the boat we headed back out to sea. Exiting the estuary the wind and tide had produced a few good waves and the girls enjoyed bouncing our way through them. Eventually we got onto calmer seas and made our way back to harbour. An icecream on the way back to base topped off a great day out in the boat with family!